Harold Ross “Lefty” Phillips managed the California Angels for the better part of three seasons to a 222-225 won-loss record. He was the Angels second manager, succeeding Bill Rigney. Phillips was a pitcher, but never played in the Major Leagues. 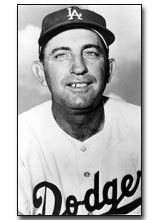 Prior to joining the Angels in 1969, Lefty was a coach for the Dodgers, 1952-64, and with the Dodgers in special assignment capacities through the 1968 season.